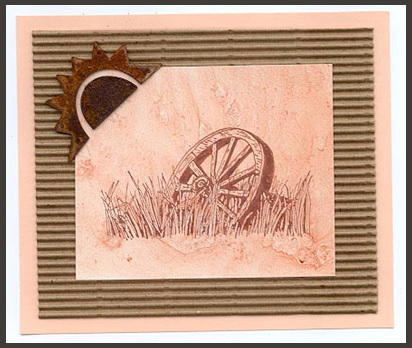 Stamp used is “Wagon Wheel, Lg.” and a rusty charm is glued to corrugated card stock and layered. Card by Thalia Sledge. Tags: Charm, Corrugated, Thalia Sledge, Wagon Wheel Lg. Stamped with “Celestial Background” which has been colored with pencils. 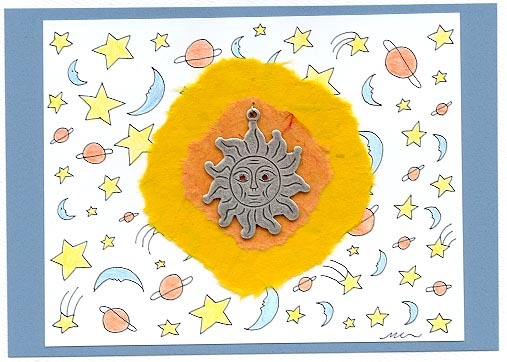 The moon charm is glued onto two layered torn paper circles. Card by Mary Connaway.